Since 1993, March 22nd has been observed as World Water Day to focus attention on the importance of preserving and protecting our planet’s fresh water resources. World Water Day has a theme each year, and this year’s theme is “Water and Food Security” and deals with the planet’s supply of clean, healthy, abundant water and its relationship to providing food to the people of the world. 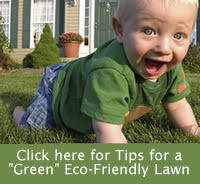 As eco-friendly gardeners, we often talk about waterwise landscaping. We know that by utilizing rain barrels, choosing waterwise plants, and using mulch, we all can help conserve water in our landscapes. But for World Water Day, this year’s theme seems to focus on "waterwise eating". "Waterwise eating" means following a healthy, sustainable diet; consuming a less water-intensive diet; and reducing food waste. Of course, we all realize that we need water to grow food for people to eat. But the “Water and Food Security” theme also wants to encourage everyone to consider the water required in the production of the food that they eat, and to adopt a diet that is less water “hungry”. Each food has its own “water footprint”, which accounts for the amount of water used to grow and/or produce that food. By learning a little about the water footprint of your foods, you can choose to make a choice for a more “waterwise” diet. The world is thirsty because of our needs for food. Today, there are over 7 billion people to feed on the planet and this number is expected to reach 9 billion by 2050. To be able to feed everybody, we first need to secure water, in sufficient quantity and adequate quality. We will also need to produce more food using less water, reduce food wastage and losses, and move towards more sustainable diets. Here’s a neat idea I saw online and its so simple, it really makes you wonder why no one thought of it before. The product is called Weed Recede and it is mulch that comes in its own, self-mulching paper bags. You just lay the bag on the ground, pull a couple of strings to open the bag, and spread out the mulch right on top of the paper bag. The video for the product says that “the landscape industry in the United States uses over 700 million and one billion plastic mulch bags each year”, most of which end up in our landfills. Anyway, if you like this product, you can vote for it in the Walmart on the shelf contest (which will make the product available at Walmart stores).